DraftLogic Electrical will place receptacles in your floor plan fully automatically or will assist you in placing them manually. 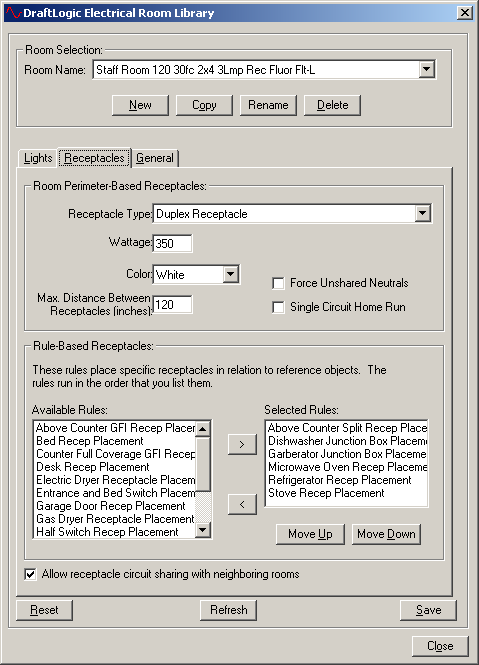 There are two methods by which receptacles are placed fully automatically: 1) the room perimeter method of placing a type of receptacle at locations around the room in order to provide service to a maximum linear wall spacing you specify, and 2) by applying rules that place a receptacle in specific reference to a floor plan location or other object in the room. For both the room perimeter method of receptacle placement and the rule-based method of receptacle placement, DraftLogic Electrical looks to one of its expert systems databases for detail on how to perform receptacle placement for each room type encountered in your floor plan. You have complete control over what room type is assigned to the rooms in your floor plan and also the specific settings of each of the room perimeter receptacles and rule-based receptacles. The Room Library Dialog with the Receptacle Tab Active. To determine the number of receptacles needed to ensure that there are receptacles on the room perimeter within the maximum receptacle spacing distance you specify for a room, DraftLogic Electrical takes several steps…all completed in milliseconds. 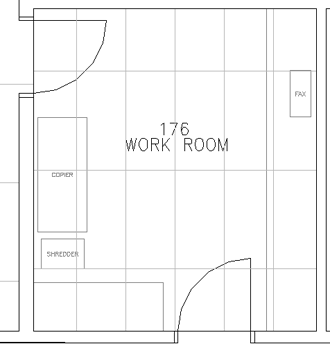 DraftLogic Electrical retrieves the wall, window, door, and counter locations from the floor plan, determines the spaces around the room that a receptacle can or cannot be placed (e.g. not behind counters and door swings), and gathers the required information (e.g. receptacle type, wattage, spacing) for this room type from the Receptacle Library database. All of this information is processed to arrive at the quantity of the specified receptacle that need to be spread throughout the room to achieve the desired receptacle spacing and the eligible places for receptacle placement. Receptacles are placed in allowable locations to provide the service spacing that was desired without placing too many receptacles and unnecessarily increasing construction costs. From time to time, you will encounter a room that does not lend itself well to Automated Placement of receptacles. In these cases, or in cases where the architect has supplied specific receptacle locations desired, DraftLogic Electrical will still make your work easier and with reduced probability of errors. DraftLogic Electrical knows what sort of placement each type of receptacle requires. So a wall-mounted receptacle will find the nearest wall location, snap to it, and rotate to its angle. A floor or ceiling receptacle will go where you place it and not look for walls to snap to. The Auto Reload feature places another of the same block you have just placed on your cursor and carries over any attribute values you have set, all of which is designed to reduce the number of clicks and keypresses you need to make for placing electrical systems devices. Where you may normally have to perform eighty or more clicks and keypresses to place ten receptacles around the perimeter of a room and specify the attributes of each, DraftLogic Electrical will empower you to achieve the same result with only thirteen clicks and keypresses, a savings of over 600%!